I'm a bit late getting to my monster report this month. I'll be honest, it's because I thought the melc and the plat were anomalies, and that maybe the monsters weren't as common as I originally thought. I hadn't seen anything indicating monsters during my walks early in the month, so I focused my time and efforts on a hundred other things--other projects, other books, survival--you know, the usual. The truth is, I was wrong. Very, very wrong. This summer has been very wet. We've been plagued by rain and thunderstorms. I personally like rain, though my wonderful dog hates it (he also hates lightning, thunder, fireworks, alone time, birds, vegetables, and motorcycles). I frequently walk in the rain, or right after. 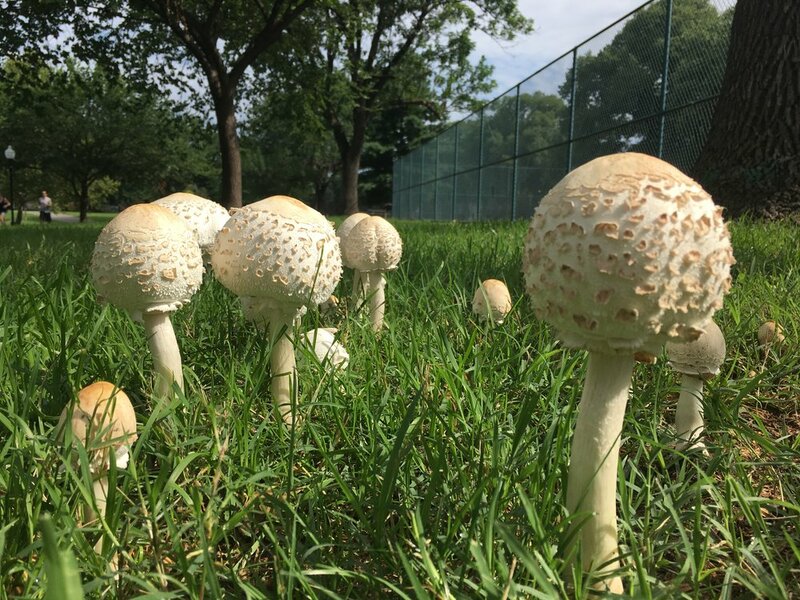 The first time I walked after the rain, I noticed these mushrooms. Cute, white, with speckles. They grow in circles--fairy rings, I thought. 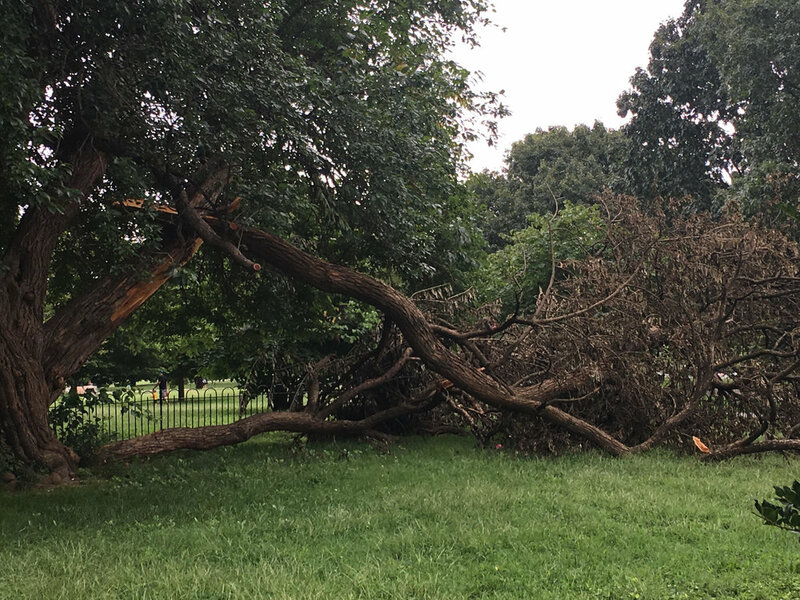 After the second rainstorm, I noticed several trees scattered throughout the park, their limbs torn from the trunks. I though it was odd, as there hadn't been any major winds, but you know--city trees, am I right? After the third storm, I noticed another patch of mushrooms, these ones much weirder than the first. I stared at them for a few minutes--and that's when I suddenly saw it. These weren't mushrooms. They were EGGS. And not just any eggs--dublagat eggs! Don't worry, I kicked, stomped, and smashed those eggs until nothing was left except fragments of chitin scattered through the grass. Once I realized they were eggs, that's when I saw the pattern as obviously as if someone had circled it in red marker and painted it on my face. 20/20 hindsight, you know? They lay their eggs in the middle of fields, because the eggs draw nutrients from the soil and plants around them and so can grow extremely large--they need a lot of space. They also grow in a variety of shapes and sizes, so the first mushrooms I saw were probably eggs as well. The other thing about dublagats is that they love sun and hate trees. They will make a point to go around and try to assassinate trees--hence all the arboreal damage. As for why they did everything in the rain? My guess is because they're in the city, and when it's raining there are fewer people around. Easier to not get spotted. But who knows--they're monsters. I'm actually not surprised that I didn't notice a dublagat in the park. They are masters of disguise. They have long stringy fur that can adjust to any texture color, making it easy to blend into whatever is around them--and the more texture and the more color, the better. They also make their eggs blend in (ie mushrooms). They're probably hiding in the community garden, come to think of it. Lots of food there (rabbits, birds, tomatoes), as well as plenty of places to hide among the vines and raised beds. A dublagat can grow as many heads as necessary. It's fur is really rough, and can be turned into thread. They're pretty easy to decapitate, and barring that, you can always run away (they're pretty slow). The thing you've gotta watch out for is their spit. Imagine a llama or a camel--except with acid. Yup. Lots of it. Your best bet is to sneak up behind them and slice off their heads as quickly as possible (in one stroke, preferably), or if you can't manage that, use a distance projectile weapon, like a slingshot or a bow and arrow. Now, I can't emphasize this enough: BE CAREFUL. The world is riddled with monsters, and you just never know where they might be hiding. Stay alert and don't let your guard down. I'll let you know what else I discover in the coming days. Watch out for monsters and may the garg's blood rain!